Up early, I head out alone, looking for sunrise and sand dollars. My young guest has asked me to find one for him today. It’s a pink blaze of sky. I have beat the shell pickers. They sleep in on Sunday. I walk a long way in solitude except for the shorebirds. There are no sand dollars. When I reach Beer Can Island, I decide to turn around, shorten my walk a bit, to get home to my guests. But, there’s the slice of a fin on the surface. I watch the dolphin fishing for breakfast not far from shore, gliding along the surface. Still, almost all the way home, and no sand dollars. I am wading and looking. I see a man in a bright blue t-shirt, he’s holding out his hand and asking, would I like a sand dollar? 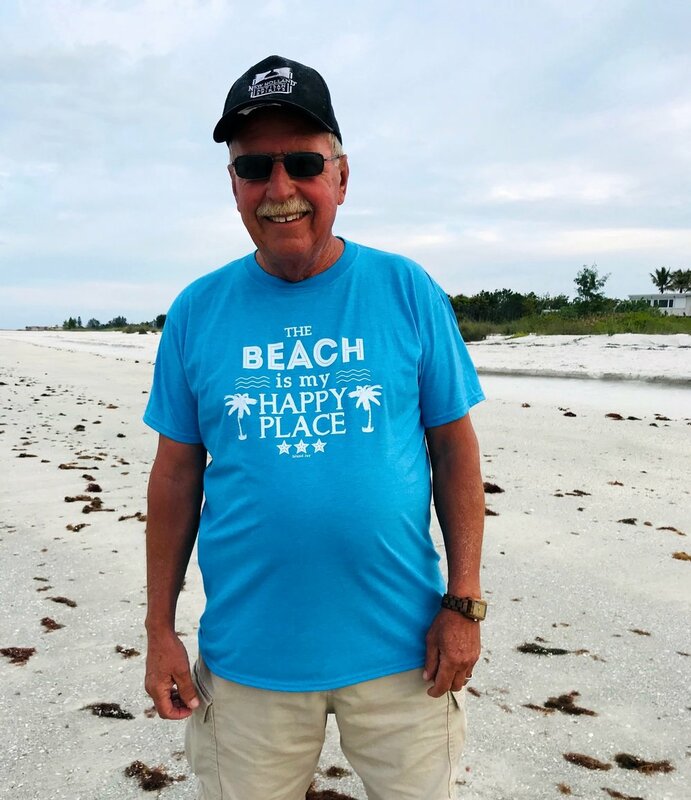 It turns out, this man who is paying it forward is named Ron, and I know the beach is his favorite place because his t-shirt tells me so. Heartily, I thank him for his generosity. I continue my walk, and now, of course, I’m very happy, very satisfied, and find two more. My young friend is delighted. Later, in the afternoon, when my husband takes our guests out for some fun on the water, I stay home and write. I am working on the post card poems, I have group tomorrow, and I want to have something written. Just as they arrive home I have finished my draft. One week from today we depart from this magical place.